Are you a wine lover with a collection of bottles that you need to store but want to keep accessible as well? If this sounds like you, then we have the perfect storage solution to suit your needs. 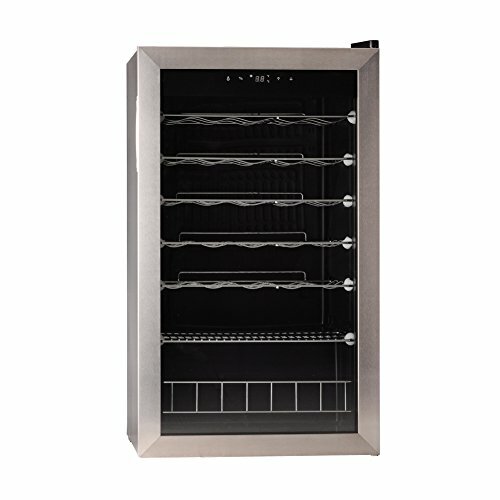 The Smad wine cooler fits 35 bottles into a sleek, stainless-steel unit. It’s so stylish you can use it as a personal cooler in your home without ruining your decor. What’s more, due to its large storage capacity it could also be a great asset to restaurant owners. Measuring a compact at 18.9 inches by 19.3 inches by 33 inches and weighing 48.5 pounds, the Smad is perfect if you have limited storage space. You can leave it freestanding on the floor or place it on a counter. You could also put it in a cupboard as long as it has enough ventilation. For proper air ventilation, it is recommended to leave 5 inches of space at the back and the sides. There is only a little assembly required; before using it you must install the drip tray in the back of the appliance. The manual doesn’t give directions for drip tray installation, although we found it easy to locate the position without guidance. Once you’ve done this, then all you need to do is plug it in, set the temperature and let it cool down. Let’s look in detail at all the great features this product has to offer. The Smad has an attractive, stainless-steel exterior, with a glass door front. This means that it’s not only practical but also aesthetically pleasing. This cooler is chilled using a compressor rather than a thermoelectric generator. A compressor uses refrigerant and can get colder than a thermoelectric model. The use of a compressor is advantageous because it can withstand higher ambient temperatures. Moreover, it generally has more longevity than a thermoelectric cooler. Storage space consists of six wire shelves, with a deep compartment at the bottom. It has a volume measure of 25.1 gallons. All the shelves slide out effortlessly for easy access. Shelves can also be removed if you need to make space for larger bottles or wine boxes. A digital control panel at the top of the glass door allows you to easily adjust the temperature settings, giving a choice of Celsius and Fahrenheit. The temperature range is 4 to 18 degrees Celsius or 40 to 65 degrees Fahrenheit. An LED display clearly shows the temperature. The touch-screen control panel also incorporates a light switch. Additionally, the cooler is energy efficient, using only 85 watts, so you won’t get a shock when your electricity bill arrives at the end of the month. Once the Smad is operating, it is surprising how quietly it runs. In fact, when I first used it, I double checked that it was still running a few times. One thing to bear in mind is that the 35-bottle capacity refers to regular-size, 25-ounce bottles. You can fit larger bottles—such as a magnum of Champagne, for example—but this will reduce the overall amount you can put inside. Some people might find that the blue LED lights aren’t sufficient to illuminate the inside of the cooler. This could make it difficult to see the wine without opening the door. However, this is only a problem if you have it in a dimly-lit place. You’ll have space to lay down larger bottles, but there’s nowhere to store them upright when all the shelves are in place. However, because you can rearrange or remove the shelves, you have the ability to customize it to suit your needs. Because there is so much space, the Smad is very versatile. If you don’t have enough wine to fill it up, you can store water, beer or soft drinks instead. The back of the appliance is exposed, which could be problematic if you have small children or curious pets. This can easily be remedied if you place it close to a wall. Keep the unit out of direct sunlight. Also make sure it isn’t close to other sources of heat like a stove or a radiator. Lastly, as the digital panel is located at the top of the door, you should take care when opening and closing the door. Otherwise, touching it accidentally could change the settings. I didn’t have any problems with the cooler and love how compact and quiet it is. It’s been the perfect addition to my home and I hope it is for yours too.